Walau seringkali diabaikan, bantal cincin sebenarnya memiliki peranan penting dalam sebuah pernikahan. Bantal tersebut merupakan wadah bagi cincin pernikahan yang melambangkan janji setia dan komitmen antara pasangan suami istri. Jadi, setelah Anda telah memilih detail pernikahan lain seperti jenis bunga atau boutonniere, jangan lupakan juga kotak cincin Anda! Jangan puas hanya dengan bantal atau kotak cincin yang sudah umum digunakan. Akhir-akhir ini, bantal cincin hadir dalam berbagai bentuk, tema, dan ukuran. Bahkan, ada berbagai alternatif unik dan seru seperti kotak cincin dari buku antik, serta wadah cincin dari kayu atau lumut! Liat 13 ide wadah cincin pernikahan kreatif yang telah kami pilih khusus untuk Anda. 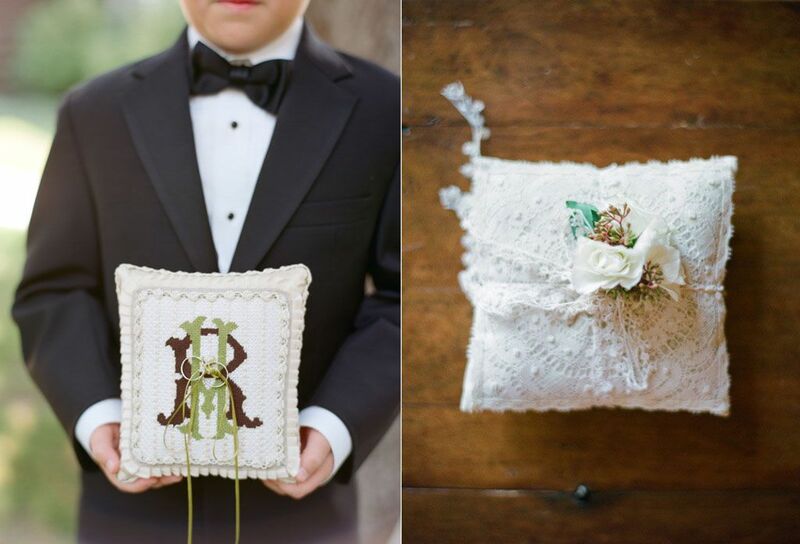 First on the list is the classic ring bearer pillow. This option works every time and suits any kind of celebration, from a white wedding to an intimate soirée. An all-white ring pillow never goes out of style, and you can customize it simply by choosing a different color for the ribbon. Outdoor or rustic weddings pair especially well with unique ring holders made of natural elements. Show the photos above to your decorator, event stylist, or ring box designer. 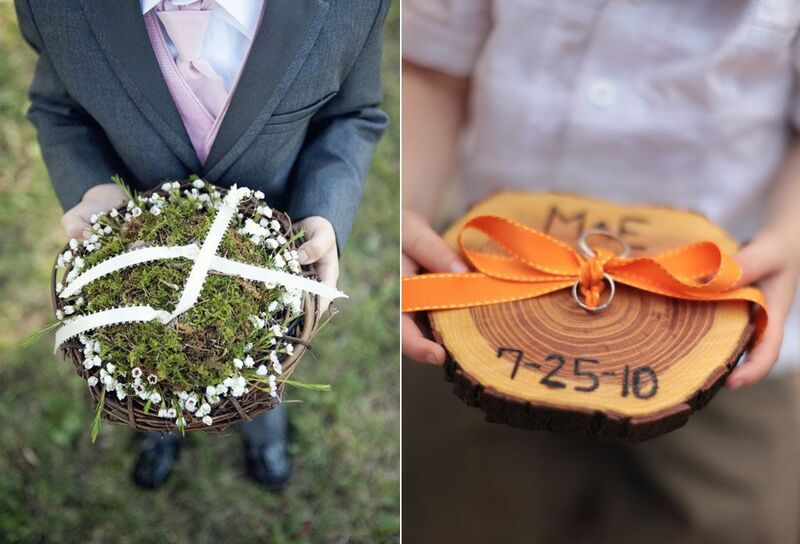 Which one do you prefer, a lush moss ring holder or a wooden log tray to hold your wedding rings? 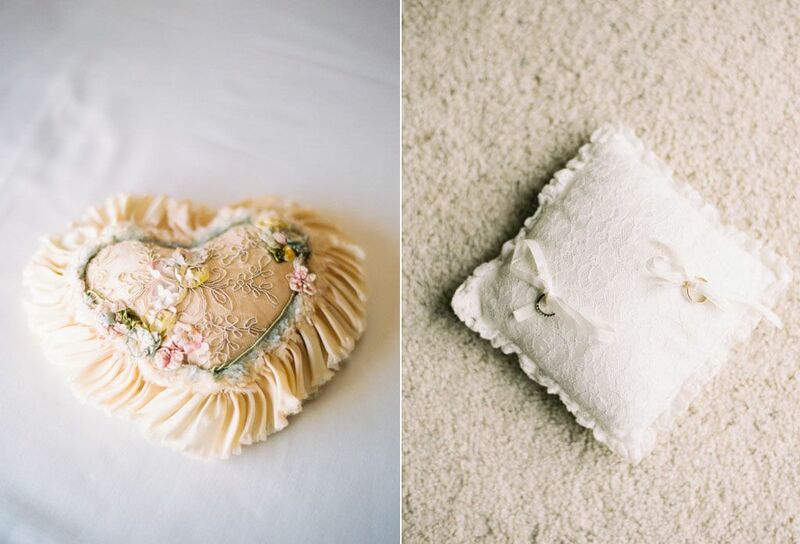 Here's another way to spice up your wedding ring pillow; play around with different fabrics of any color or pattern. The pillow on the left has elegant blue flowers, while the striped one on the right is more playful and vibrant. 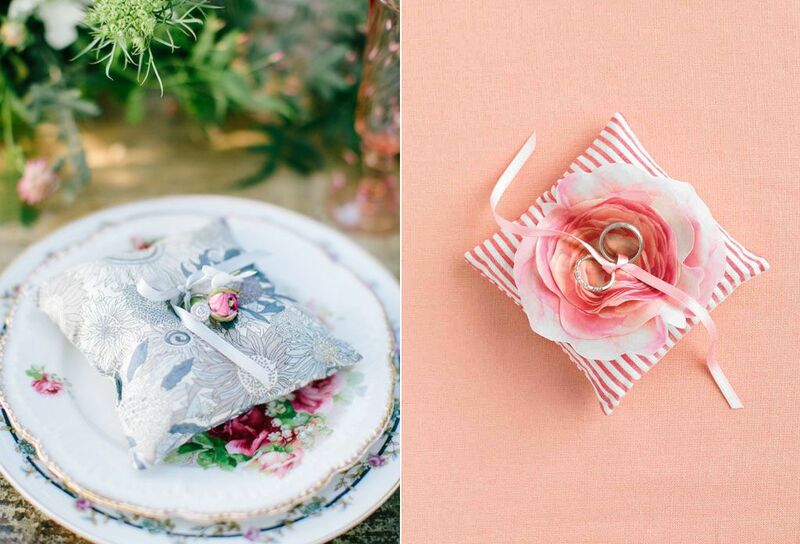 If you can't get enough of flowers on your wedding day, try this simple yet foolproof idea. Prepare a block-shaped flower cork and push in daisies, baby chrysanthemums, or other puffy flowers to fully cover the cork. The result? A beautiful flower box to tie your rings on. This is a great idea for all you romantic brides. 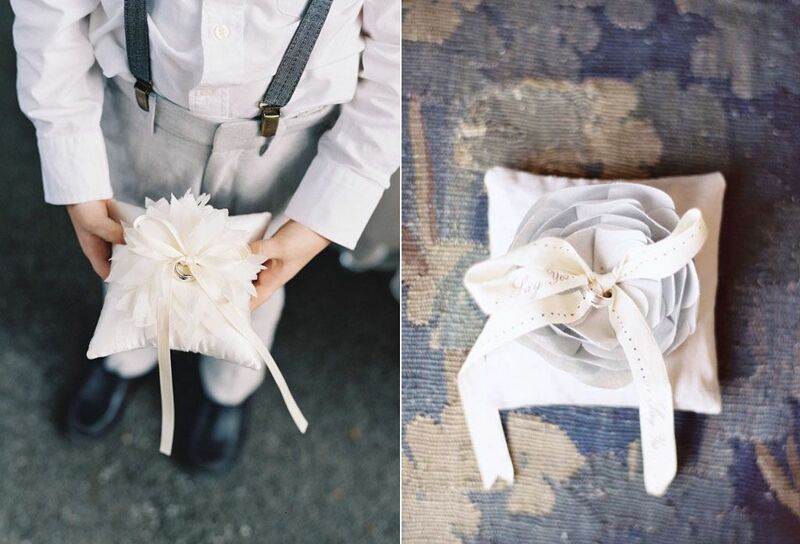 Have a blooming flower made out of fabric in the middle of your ring pillow and tie your rings at the center. 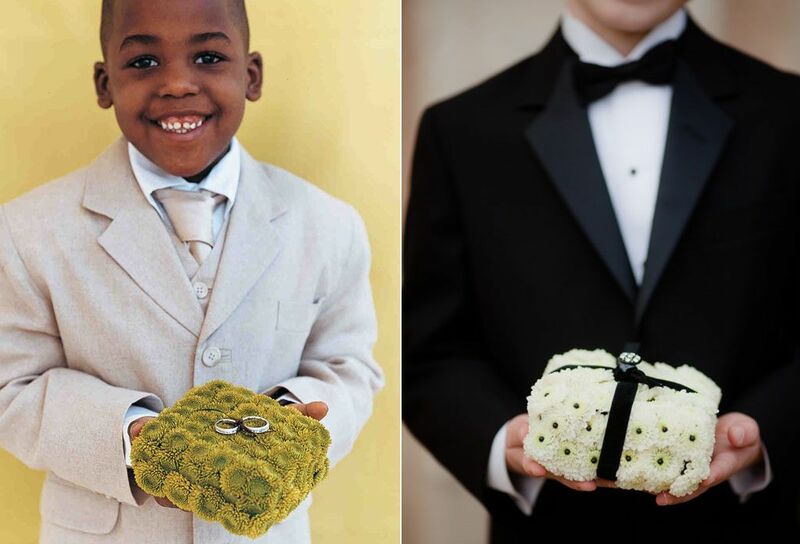 Imagine your ring bearer carrying any of these cute pillows down the aisle. What a lovely sight! As we said earlier, you don't have to use a pillow as your ring holder. 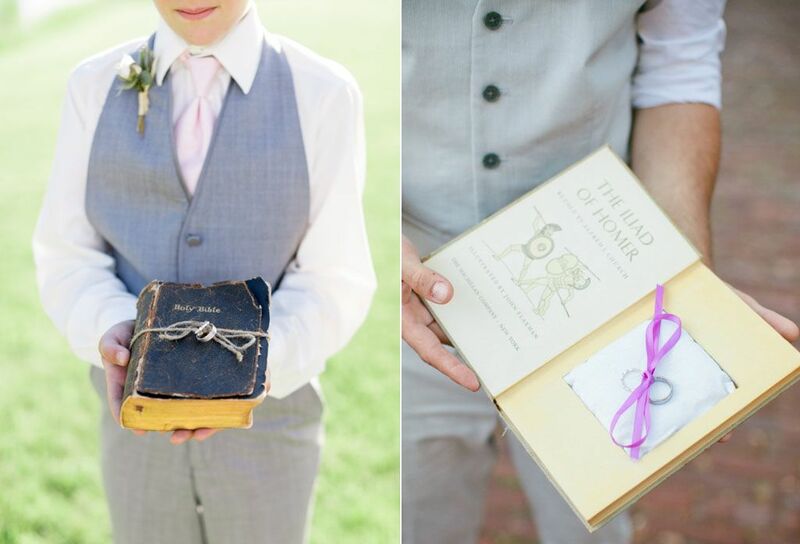 Bookworms will especially love the idea of using antique books as ring boxes. You can tie your rings around the book, or cut a box-shaped hole inside an old, unused book instead. 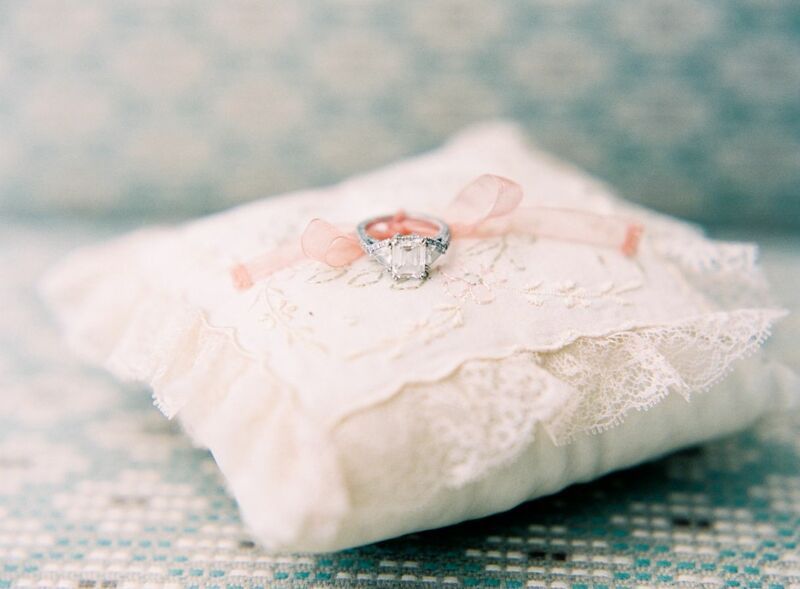 Crafty brides should not miss out on this sentimental ring pillow idea. Consider knitting, crocheting, or cross-stitching a ring pillow of your own. Alternatively, ask your mother, mother-in-law, or grandmother to make one for you. After the wedding, you can keep it as a keepsake to remember the day by! 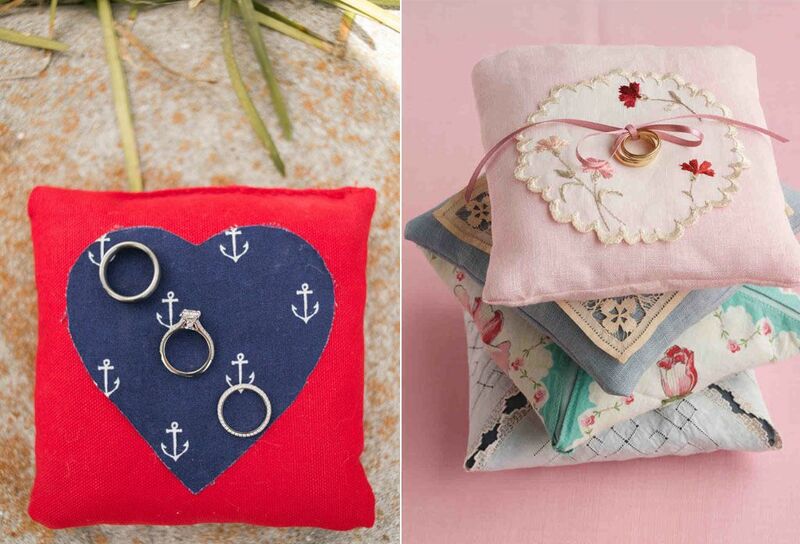 Lovers of everything vintage or retro will adore this charming ring pillow idea. Combine pretty lace and dainty ribbons to create a romantic ring holder that would be perfect for an intimate vintage celebration. 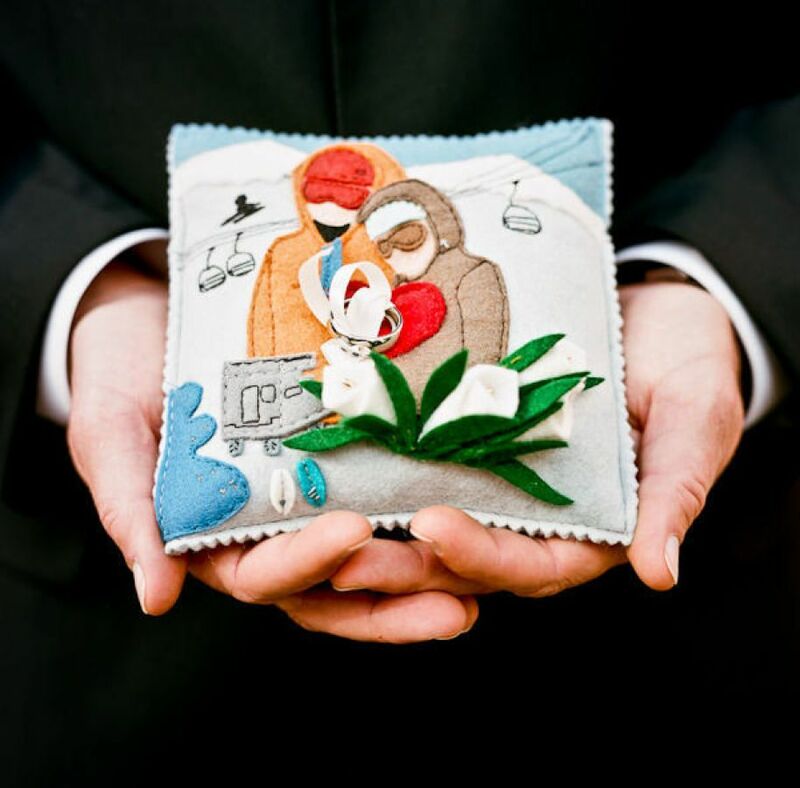 Show off your sewing skills by making a DIY, completely-personalized wedding ring bearer pillow. You can experiment with just about any that suits your wedding theme; nautical, vintage, romantic, you name it. It's the perfect time to play around with different patterns and fabrics. Here's another great idea for your wedding ring holder. 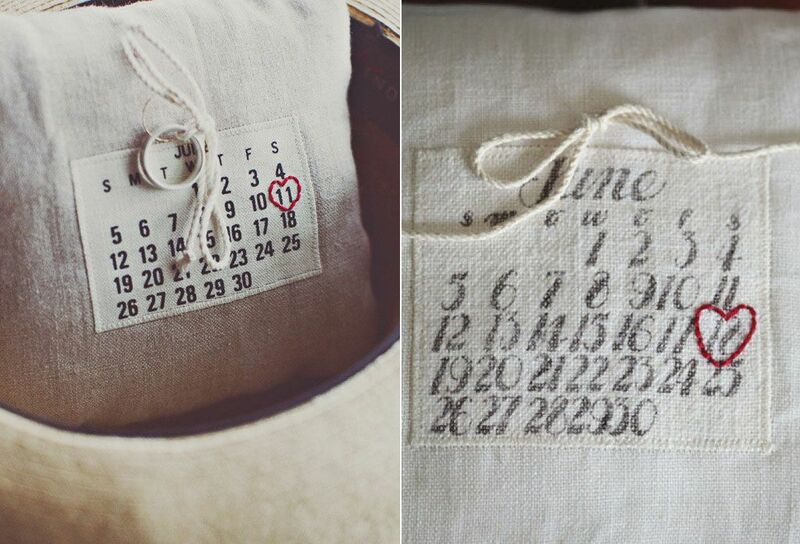 Sew a calendar onto the pillow and mark your wedding date with red thread. This way, you can use the ring pillow as a prop for your save-the-date announcement photos. Don't be limited to only square, round, or heart-shaped pillows. As you can see from the photos above, bow-ties and dog-shaped ring pillows make great alternatives! 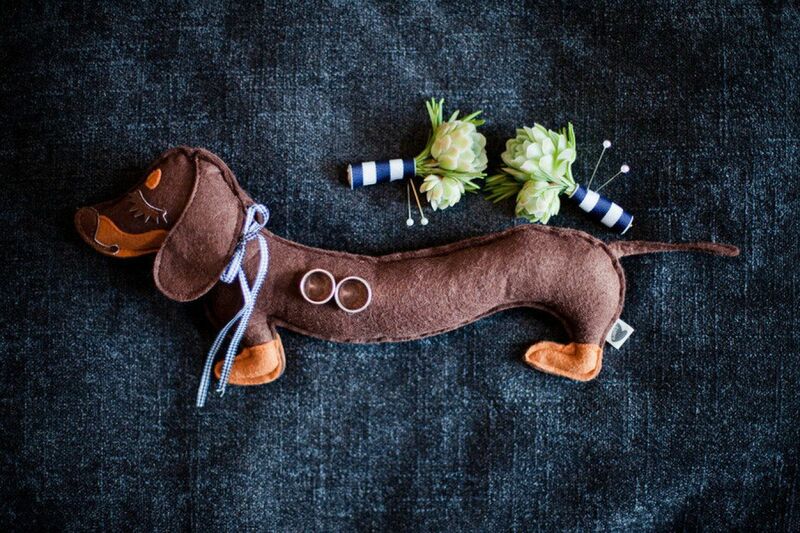 If your dog is an important part of the relationship, why not use a dog-shaped ring holder and ask your furry friend to carry the pillow down the aisle? Want something other than a pillow? No problem. 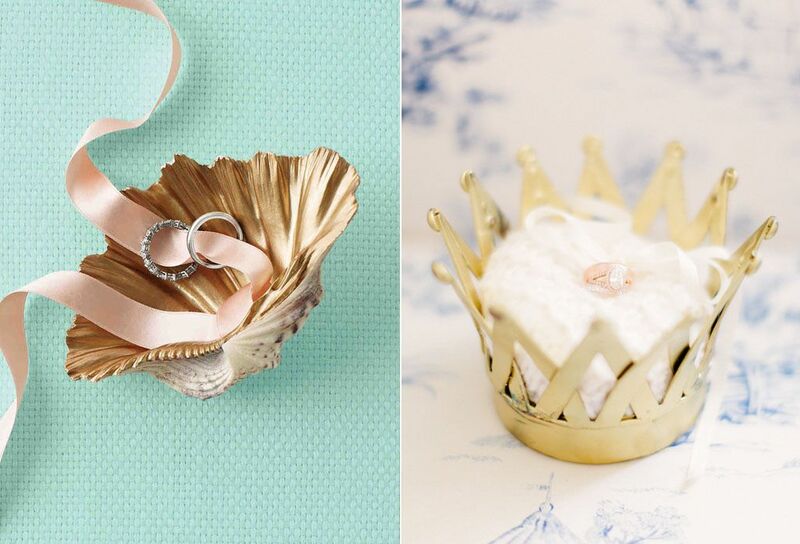 As the lovely ring bearer pillow alternatives above show, a wedding ring holder shaped like a crown or shell can do the job all the same. 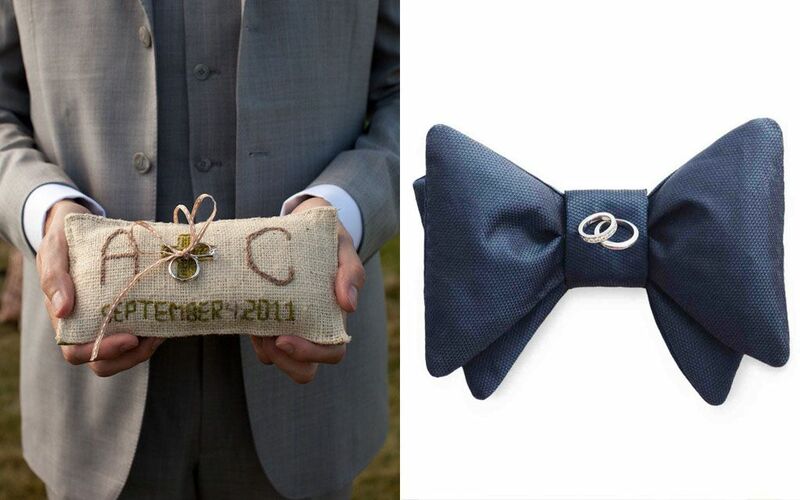 Last but not least is a completely personalized ring holder that represents your relationship. Don't you just love the flannel ring pillow above? It is definitely one of a kind and you can use it to tell your love story to the kids in the future.